This quilt was started as a way to use some blocks that were left over from a previous project, The blocks had lots of colours in them. I wanted to make something to resemble a landscape, so grouped some blocks with similar colours and added strips in between. The blocks and strips were then framed in a light blue fabric with a pattern that looked like clouds. I wanted a very big tulip to be in the centre of the quilt, and with the background finished, I drew it to size and appliqued it on top of the background and border. One of my goals in making this quilt was also to practice some freehand machine quilting on a piece that was not too unwieldy. I had a lot of fun thinking up different kinds of doodles that would fit inside the space between the wavy lines. I also played around a bit on the tulip itself. The result is so-so, but I hope to experiment more with this kind of thread work later on. This will be my contribution to the 10th Blogger’s Quilt Festival. A small jubilee, since I have participated in all of them up to now. 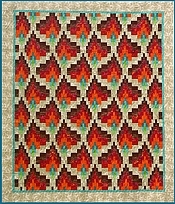 My quilt is entered in the Applique quilt category. 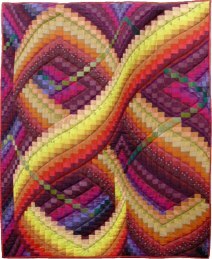 Be sure to visit the Blogger’s Quilt Festival to see all the entries. This is gorgeous! It just jumped out of my blog feed. Lovely!!! Det flotteste jeg har sett på lenge! Du er en stor inspirasjon for mange quiltere. Tusen takk! Beautiful! Your quilting is just fabulous! Wow, you are a true fabric artist! Gorgeous! It’s stunning!! Your thread-painting and detail work! Sååå nydelig! Kjempefine farger og quilting. Du er råflink:) Lykke til! Absolutely stunning! Love the colors you used, the stitching, the depth created–it’s all just beautiful. Your quilt is beautiful! 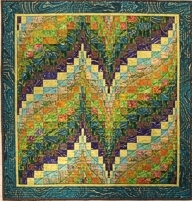 I love the thread painting and the layers created by the quilting. as always, a lovely quilt!! i love your creativity! it’s stunning to see what you do with materials. thanks for sharing and have a great day. Thank you, benta, I am glad you liked it. I googled Sheena but only five very blurry photos turned up in the image search (strange…?). Found her website and there were a few more photos, but not very many. 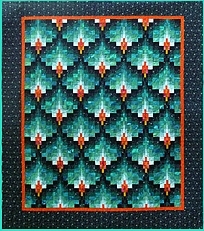 Finally searched in Pinterest, and lots turned up, including some sea scapes with similar quilting on them. I don’t think I’ve ever seen a tulip this realistic. You captured the flower gorgeously. I always liked tulips and was wondering why there isn’t a design that actually looks like a tulip instead of just the outlines. Job well done! And I absolutely love the pieced background you used. The quilting looks absolutely fantastic! Thank you very much, Kati R. There are so many types of tulips, – when I drew mine, I had in mind the ones with lily-like, pointed petals. I am pleased you liked it. Actually outline tulips are easier to sew, which is something designers keep in mind when publishing patterns, I think. So unique and beautiful. You did a great job with the quilting – I’d say your practice was a success!! This is truly a work of art! Stunning! I *love* when quilters are able to successfully incorporate earlier blocks into new projects and you did just that! This is fabulous! Beautifully executed quilting, too! Yum!